Huawei Mate X, the first foldable phone by the Chinese company, is coming this year. Huawei has so far been pretty unclear about the exact launch date. Now, it seems that they have unintentionally spilled the beans. On the website called Vmall, which is an online retailer run by Huawei, the company has posted the page offering the new phone. On the page, June 2019 was stated as the release date. What gives this possibility even more credibility is that the page was later removed. 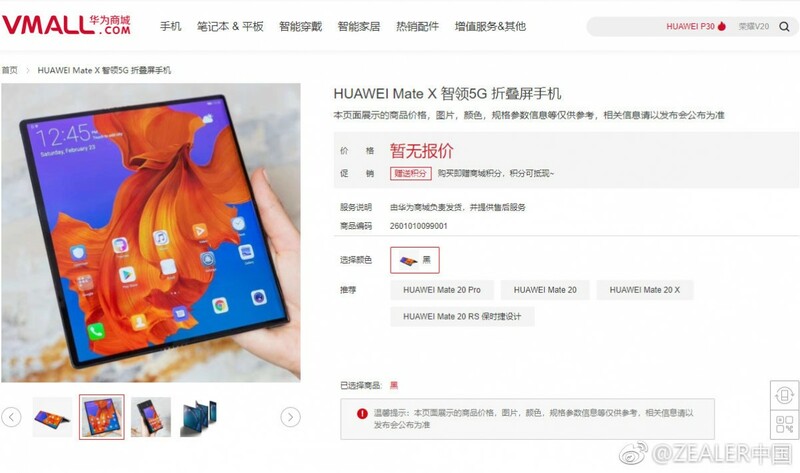 Huawei Mate X is Huawei’s first foldable phone, and perhaps their first 5G device. Officially, it will come with quite a steep price of 2.300€. Its specs are no secret, so let’s go over them once again. The Mate X will be powered by a 7nm Snapdragon 855 chipset. In terms of memory, it will come with 8GB of RAM and 512GB of internal storage. The main star of this phone, though, is its display. It will be a two-fold screen which, when unfolded, has the diagonal of 8″. This will all be fed with power by a huge 4.500 mAh battery.